I will start by declaring that I made these just for fun/speculation. I do not claim any ownership over any of them (IP, art or even ability concepts). They are not balanced because we do not know the rules and it is not my intention. They are just fun/wishes/speculations about what we could potentially see in the game at some point. No real card images to create some clans and neutrals yet, my photoshop is functional at best, my wording is lacking and I use a demo font for the words so the numbers are different font. Enjoy, or suffer, them for what they are. Feel free to offer your own cards, speculations,... But in the end, just have some little fun. If the powers that be consider those innocent images dangerous, just let me know. Nice. You must have put together some templates there to get it all to work out. I am guessing the lack of Dragon Clan and Phoenix Clan cards has to do with the fact that there wasn't a large sized preview of one when you put it together. Where'd you get the Crab art from? Since the Utaku are quite very honorable, I guess they should be able to at least defend themselves politically. I think the Utaku will be rather well-balanced, Utaku has always been about balance (in my opinion). About the wording, I guess "+1 MIL while attacking a province" is enough. During normal times, you use your MIL during a MIL conflict, so the precision is an overkill. And if you have cards to manage to switch the nature of the conflict, then good for you and you should definitely benefit from this +1 MIL eventhough the conflict changed to POL. Not only do they conduct themselves with honor, they have among them some of the most renowned haiku poets outside of the Crane Clan. Wintersong, if you could possibly share the templates, I'd very much appreciate it. tallking to the correct person this time. I like most of these, though balance (as you said) may be completely off, as there's still a lot we don't know. In particular, I suspect the Kakita Prodigy would be too strong. A kill duel with no real cost (a condition, yes. but not a cost) will probably be too much in 'New5R', especially since she's effectively a 6 in that duel. After looking at the Ide i feel sad cavalry no longer has a rulebook effect. Now that we have political conflicts it would totally make sense that being able to reach them first would be advantageous. 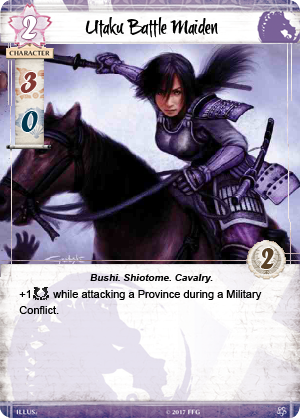 I hope some of the conflict cards for cavalry can be used that way . You are correct. 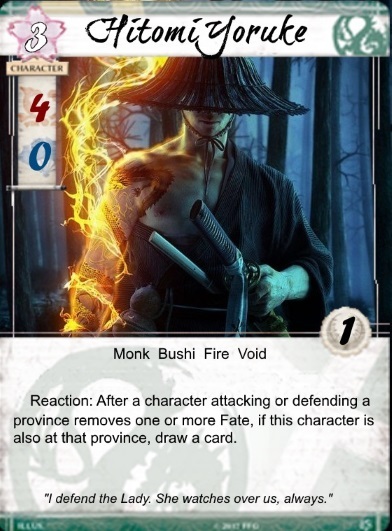 I can try some resizing of cards like Isawa Masahiro instead of just waiting for FFG to be nice and spoil a proper sized Dragon and Phoenix cards next wednesday. I do have some nice art selected for them in any case and will upload some crazy ideas as soon as I can. Pinterest do have some interesting galleries though. Or DeviantArt despite it being more tricky sometimes. Not knowing the rules makes me no favor in the wording department. The bonus is specific to avoid bonus in Military duel while in Political conflict. 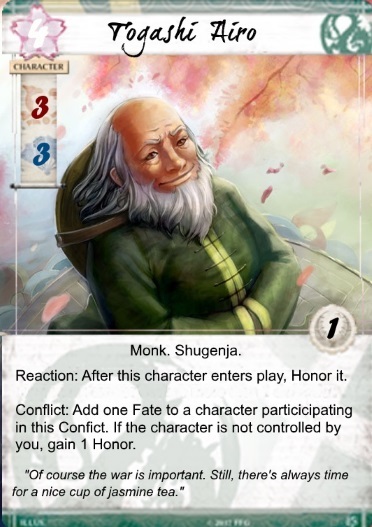 Not that I have any idea about what FFG is doing about duel cards but it did not seem fitting for the shiotome to go charging during a court. She does have 0 in Political, so can take part of Politicals. And if the Unicorn manages to go honoring characters, she has 2 Glory. She does have 2 Glory in case of dishonor too. I would expect battle maidens to focus more on the military side and stuff like Border Raider would be in that line. But it should not prevent more militant versions without falling into Matsu Berserker territory. Sure, no problem. I will try to add Dragon and Phoenix when I manage to work on them. No promises on Provinces, Holdings and such but if I do them, I will add them to the album. 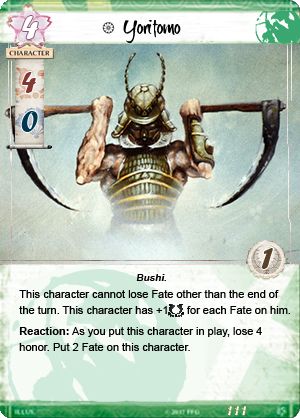 Totally not fake templates for the totally fake L5R LCG cards. Ops! Wrong Kakita Prodigy up. Not that the correct version is super balanced or anything but she was meant to be doing deadly iajitsu duels, not deadly poetry ones. But surely you are right about the "no cost" part. So far cards in Nu5R don't kill, they discard. 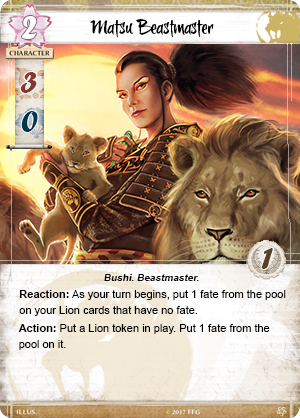 Also if you want your Kakita there to be a little less crazy, she can probably remove a fate token from the loser and go down to 2 cost. Honored Characters you control have +1 glory. I knew I forgot something... Brushtip Texe font demo For regular text is just Arial and the numbers use Forte. Added template for Phoenix and Dragon but I am not very good at scaling and keeping quality. Better than nothing, I guess! Also, a couple of characters for those clans. For funsies and inspiration for people with real design skills. You, sir, have done some great work. Thanks for the templates! I think the Mantis green should be altered to be more of a blue-green to keep it really separate from the Dragon. But, it will be interesting to see the break down in the initial set of how many generic, common unique and truly powerful personalities each clan has. 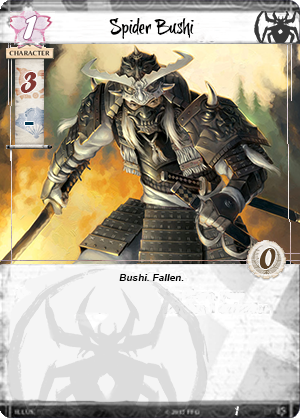 Once the breakdown is known, it might be worth coming up with a set of Mantis or Shadowlands (or Imperial) cards. With the current green I have no issues telling apart Mantis from Dragon. But I will see if I can improve it. Meanwhile, it is just silly fun to mess around with all this. So I added some new friends to the album. I am guessing that each clan's core is going to be made of 10 personality cards. The Lost (i.e. "Spider") This is going off the concept that there would be no goblins, ogres, or trolls to speak of and oni are things that get summoned from the conflict deck while undead are created via the opponents own personalities that run of of fate (i.e. they are a primarily magic faction). Of course, there could be more personalities per clan printed in the initial set-- maybe more like 12 per a clan. And I am mostly relying on previously established characters here while the new universe is actually a chance to invent all new characters. Anyway, can anyone come up with better lists than this? Good job on this card. The first sentence could read like this, "This character can only lose fate during the fate phase." Also, giving Yoritomo no Political strength is grossly underselling him. The man was far more shrewd than most give him credit for. You don't form an Alliance of Minor Clans and then forge them into a unified Great Clan and not understand politics a little. Ah, Lion harpoon. Good times...for some people, anyway. Uncle Iroh needs the Fire. trait. Yeah, I meant to include that. That's a major screw-up. heh.